Hello, I'm Gregor and I put this site together. 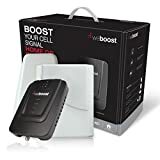 At first, you'll find an overview of recommended cell phone signal boosters, followed by a public poll and a general buying guide on cell phone signal booster. Further down on this page, we do link to other well-written articles and reviews about cell phone signal boosters. At last, you'll be able to weight in your own opinion in the comments section. If you also want to vote on the best cell phone signal booster, click here to view the poll. 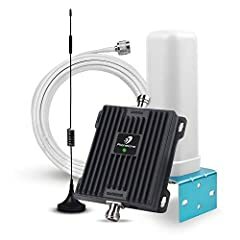 No matter where you are, you can finally say goodbye to dropped cell phone calls and slow data connections thanks to the use of cell phone signal boosters. For homes and businesses the signal boosters use an outside antenna that pulls in tower signals which amplifies the signal. The inside antenna then re-broadcasts the signal which gives your phone the best signal possible no matter where you walk around too inside your home or business. The boosters work for cell phones and vehicles be using an outside antenna that pulls in tower signal. 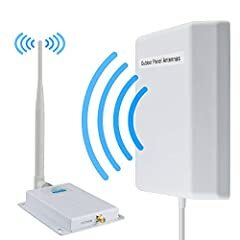 The signal booster amplifies the signal and then the inside antenna re-broadcasts the signal so that you don't drop calls or lose any data. 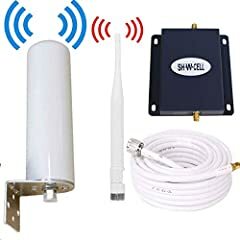 There are several cell phone signal boosters on the market, all of which work well and make it possible to have better signal all around. The Cel-Fi GO X is the best signal booster choice for when the outdoor signal is weak. 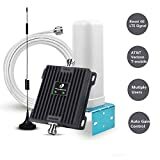 This brand of cell phone signal booster only works with phones from the AT&T, T-Mobile, and Verizon brand phones,but its amplifier gain makes it a perfect choice when you have weak signal outside residential or commercial spaces. Cel-Fi GO X creates better Gain by amplifying your signal to the highest limit allowable through use of "provider-specific" boosters. The Cel-Fi is the only manufacturer that produces specific boosters for each cell phone provider, and the GO X is the number one booster for small locations. 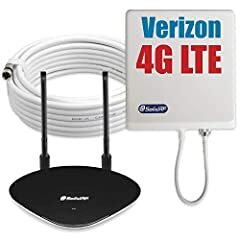 It can only boost cell-phone signal for a single carrier at any given occasion and requires a small learning curve for setting it up, but is the best choice for if you have a weak outdoor signal. 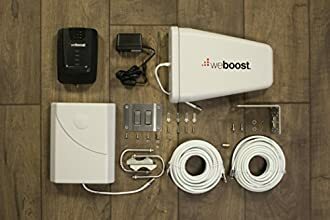 When outdoor signal is strong, but you do not have a need for a carrier-specific booster, the HiBoost Home 15K is a great kit that amplifies all cell phone carriers and has great performance reviews that stand against more expensive systems. This broadband booster works well and saves you from spending a large amount or time installing it as well as saving your wallet. It comes with many features that are packed into a package designed to be budget friendly. HiBoost Home signal boosters offer 10 dBm of downlink power at output capacity which is what most directly affects the area of coverage of the unit when your outdoor signal is stronger. The booster has a screen that is LCD and made to show the strength of the signal. The 10 dB downlink out power is what makes the HiBoost Home 15K a competitive choice against more expensive options. For small homes or apartments that are under 1,500 feet, the SureCall Fusion4Home is a fantastic option for budget-conscious users. This particular booster provides coverage for 1-2 rooms and comes with panel antennas. SureCall boosters are best for places that already have reasonably strong signal, about 2 bars or more preferably. The SureCall Fusion4Home provides better coverage that reaches the entire area so that you don't drop calls in smaller homes or apartments, and is quick and easy to install. The yagi outdoor antennas and panel indoor antennas on these boosters come highly recommended and work well! The whip antenna that is another option for the device is a cheaper option, but the performance isn't as good. If you need better service for your small indoor areas, the SureCall Fusion4Homes is the one that won't let you down! Then there are larger homes and medium sized offices that reach up to 10,000 square feet. 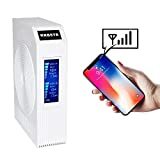 There is a particularly great cell phone service booster for these larger sizes homes and businesses called the Wilson Pro 70 Plus. 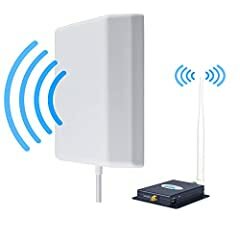 The design and unit construction of the Wilson Pro is of the highest quality which gives it great performance reviews by its users and has allowed it to become one of the most bought cell phone signal booster units. It offers great performance at an affordable budget for all price point. It comes close to to maxing out the FCC's rules for civilian broadband boosters because it has up to 70 dB gain and 10 dBm output of the downlink power. These high numbers means that it offers a solid overage area that avoid calls being dropped, and works at optimum strength when the outdoor signal is already strong as well, providing 2-3 bars or even more. The SureCall brand also comes with Fusion5x 2.0 that has even better performance reviews than that of the Wilson Pro Plus unit, and comes with fantastic antenna options, but sadly without any LCD screens to display the signal strength. It is another perfect choice for large sized residences and small to medium sized office spaces. It is built in configurations with 4 domes and panel antennas in the buildings that makes it unique in its price range. The antennas and building domes comes with the highest gains and output power performances possible. Fusion5x covers a larger area even though it comes in a smaller size. though one minor disadvantage of the Fusion5x by SureCall is the fact that there is no abilllity to manually control the device's gain on each individual band, in order to shut the particular bands off. It does, however, provide a great coverage area and a strong cellphones signal inside your chosen location. Large buildings, such as warehouses, commercial properties, and more that exceed 10.000 square feet, often have a hard time getting a cell-phone signal inside their building. There are several strong cell phone service boosters that can be mounted in these large buildings that provide enterprises with excellent service coverage and a large amount of gain. One such booster is the Wilson Pro in the 1000 and 4000 models that has excellent coverage and gain, and includes an inline amplifier which makes the cable runs possible. The Wilson Pro 1000 and 4000 lines is mountable upon walls and has 4 antenna ports useful for home-run cables. There's five different Wilson Pro boosters that are very similar but have minor differences. the Wilson Pro 1000 mounts to the wall and has 14 dBm downlink power, while the 1000R is identical to the Pro 1000 but has a chassis for rack mounts. The Pro 1050 is also created identically to Pro 1000 but contains in-line amplifiers for indoor cable that runs at a longer distance. Pro 4000 has 4 outputs and not a singular output and the Pro 4000 is manufactured identically to the Pro 4000 but has a rack mount chassis. Each of these boosters are expertly designed to provide the maximum amount of cell phone service possible. SureCall also has cell phone service boosters that are made for large buildings. Their Force5 2.0 is an amplifier system that boosts cell phone signal inside of commercial buildings. 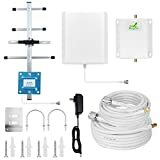 This unit has become a leader in the industry of commercial cell phone signal amplifiers thanks to the their added higher power and bigger coverage space. It has awesome features such as in remote operating and monitoring of the booster's activity, and higher downlink outpower which means even more coverage. It is a great commercial sized booster and saves the wallet by coming in at an affordable price. Cel-Fi Quatra 2000 is a booster that works best when couples with already existing, unused ethernet cables. It is a 100dB gain, unit that is a dual carrier, and has unique technology which allows it to flow cellphone signal through the use of ethernet cables. It is the newest commercial signal boosting product on the market and contains truly unique innovations. the Quatra 2000 amplifies signals up to 100 dB which is 30 dB more than boosters that are similar and made by other manufacturers. This small, but significant, number is what makes a huge difference if both the indoor and outdoor cell phone signal is weak. The only downside of this new to the market product is that it currently supports 2 carriers at once, so you have to get two systems if you want to support all 4 carriers. The unit uses Cat5 and Cat6 ethernet cables to distribute the signal instead of the standard coax. This particular unit is a great time saver for commercial industries and a money saver as well. Whether you are looking for a signal booster designed for small to large spaces, every booster on this list is a great choice and won't let you down! New: Our editorial list of additional articles. 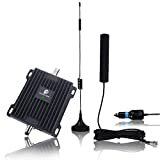 We decided to gather informartion all around the internet and present you a list of helpful, external links to interesting reads about the best cell phone signal boosters and their reviews and guides. You're not convinced by the previous writings about cell phone signal boosters? Of course you can just choose by visual impression, that's why we present you all our chosen products at a single glance. A click on any image is enough to open an external link to the best offer we could find. Today - Do Signal Boosters Really Work? Finally, we want to present you our rating criteria for our cell phone signal booster comparison, so you can better understand and comprehend our recommendations and the rating process itself. 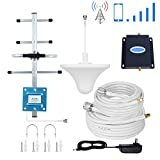 Furthermore, we still ask you to keep your eyes open for short term deals in order to make some great bargains with cell phone signal booster in 2019. Published by G. Krambs on StrawPoll.com (last update on 2019-04-23 08:18:00).